The Widgets Control plugin for WordPress is a toolbox that provides flexible visibility management features for widgets, sidebars, sections of content and content blocks. This tool helps to control where certain pieces of content are shown or hidden very efficiently. It allows to show widgets and sidebars based on conditions and you can choose to show them only on certain pages or exclude them from being displayed. An ample set of conditions can be used to display sections of content on a page as required. You can freely define WYSIWYG Content Blocks that are available for use in any sidebar and which can also be embedded in your content using shortcodes. The plugin also allows to target mobile, tablet and desktop users, so that pieces of content are shown or hidden on small, medium or large screens. The premium version Widgets Control Pro provides additional useful features, including visibility management based on Groups. 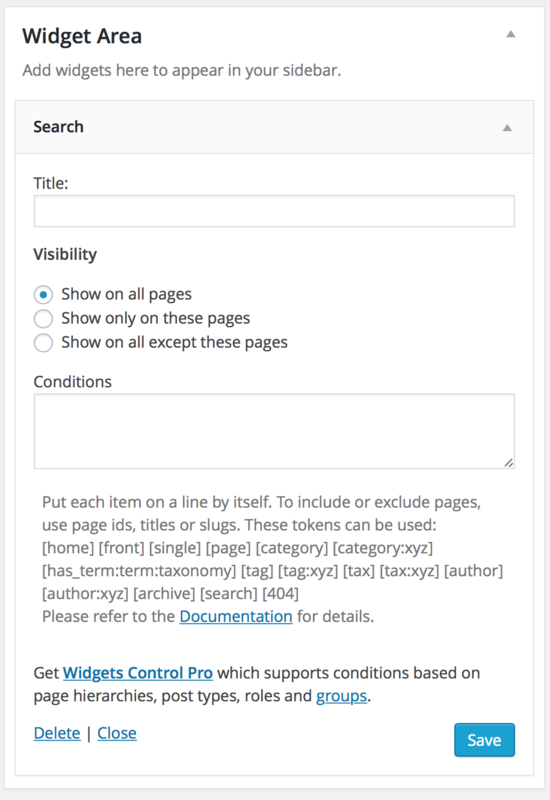 Widgets Control Pro provides advanced features, including the option to restrict the visibility of widgets and sidebars by post type, by roles, groups and authors and advanced conditional logic with exclusions.